KIC 8462852 has quickly become one of the biggest astronomical mysteries of the decade. It’ll be months before we have any firm answers on this fitfully flickering star, but astronomers intend to get to the bottom of it. How? “If we could catch it in the act of dimming again, that would really help,” Penn State’s Jason Wright told Gizmodo. Wright’s the astronomer who made KIC 8462852 famous last fall, when he nonchalantly suggested that the star might be occluded by an alien megastructure. He, along with several other astronomers I spoke with this week, agrees that the way we’re going to figure this weird star out is to watch it doing something weird. KIC 8462852, also known as “Tabby’s Star,” was first spotted in the Kepler Space Telescope’s dataset last September. Despite being an ordinary, main sequence F-type star—slightly hotter and larger than our sun—it caught astronomers’ attention. Over four years of observational data, the star’s light output intermittently tanked, something that isn’t consistent with any astronomical phenomenon we’re aware of. Explanations for the star’s unruly behaviour ranged from a swarm of comets to gravity darkening to alien megastructures. You can imagine which of those possibilities sparked a global hysteria. But KIC 8462852 wasn’t done surprising us. The mystery deepened last week when Louisiana State University’s Bradley Schaefer decided to look at KIC 8462852 in old photographic plates of the sky. 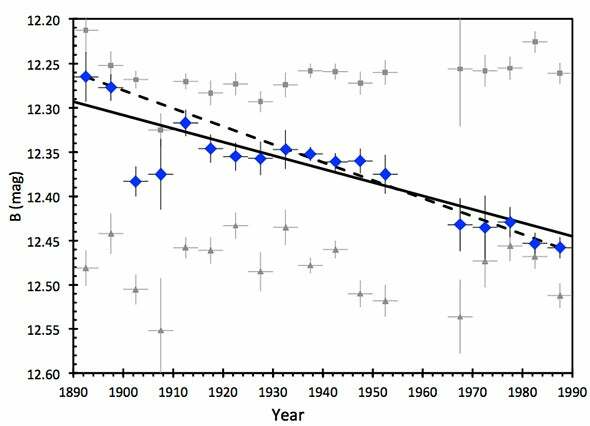 When he did, he saw something astonishing: over the past century, the star’s total light output has dropped by about 19 per cent. This star isn’t just sputtering—it’s fading out entirely. What we do know, according to Wright, is that whatever’s occluding the star isn’t emitting strongly in the infrared spectrum, meaning it isn’t very warm. That means we’re talking about something in a distant orbit, which doesn’t improve our odds of getting a good look at it. 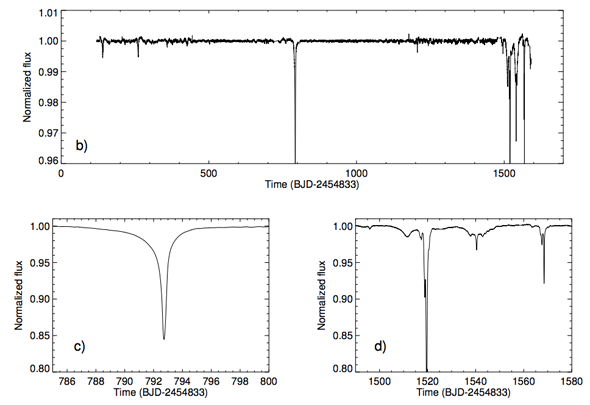 KIC 8462852 is fading over time. Blue diamonds represent measurements taken between 1890 and 1989, while solid and dashed lines are fitted trends. Via Schaefer 2016. But there is one way astronomers can learn what’s causing the star to sputter—and that’s to catch KIC 8462852 doing it again. When Kepler watched KIC 8462852 flicker several years back, it was only collecting white light—aggregating information across the visible spectrum. All we can do with this data is pinpoint dimming events. But if it happened again, astronomers would be prepared to make precise measurements in a broader range of wavelengths. As KIC 8462852's starlight passes through whatever material is occluding it, certain colours will be absorbed more than others. This gives us a spectral fingerprint, which can be used to work out what type of material we’re looking at. For the next few months, astronomers are sitting tight. KIC 8462852 is behind the Sun and only visible during daylight hours, making it impossible to observe from the ground. According to Tabetha Boyajian, the Yale astronomer who discovered the star, a few satellites are monitoring it, but the temporal coverage isn’t great. “Mainly, we are now using this time to prepare for what to do when the star becomes visible again in a few months,” she said. This includes discussing different scenarios, and figuring out what data will be needed to confirm or refute each of them. “When the dipping begins again, we will be prepared to hit it with everything we have,” she said. Wright added that although two independent surveys haven’t turned up any evidence of extraterrestrial technology, UC Berkeley’s SETI program is now working with the billionaire-backed alien hunting initiative Breakthrough Listen, and plans to conduct a very sensitive broadband sweep of the star’s neighbourhood in the next few months. The prospect that we’re looking at a bona fide Dyson sphere is as unlikely as ever, but....well, it hasn’t been ruled out. “The ET hypothesis has very little predicative power,” Wright said, noting that you can invoke it to explain just about anything—the so-called “aliens in the gaps” fallacy. Nevertheless, you can bet astronomers won’t rest until they’re sure one way or the other.